Sonny Fodera and Amber Jolene have once again reunited in another collaboration exhibiting their complimentary talents as artists. Jolene is responsible for the vocals on tracks including Mowgli ‘Back In The Day’ and Myomi ‘Sun In My Eyes’ as well as experiences both recording and performing with famous English ska band Madness. Fodera should also be a familiar name to anyone who has been paying attention to the house scene this year with a season-long Ibiza residency as well as releases on Stealth Records, Onelove, Cajual Records, Defected and his own Beatdown imprint. 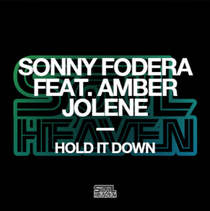 With ‘Hold It Down’, Fodera teases you in with atmospheric synths and a subtle introduction of Amber Jolene’s voice before unleashing a stomping bassy hook accompanied by Jolene’s now looping vocals. Midlands’ duo Chris Lorenzo and Kane aka Cause & Affect provide a remix with their signature bass fuelled jackin house twist. The remix is geared on a punchy snare, growling low-end and spooky lead keys that, when combined with Jolene’s voice, creates an eerie aura that makes this rendition sound like the evil sibling to the original. It’s out 11 November, check it out below.